by James E. Snyder, Jr., J.D. The Conservative Mind consists of four parts: The Conservative Manifesto; The Conservative Solutions; The Conservative State; and, The Conservative Challenge. 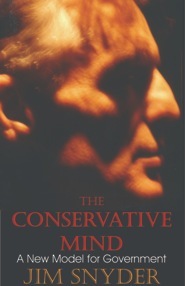 The Conservative Manifesto consists of five chapters which serve to connect past conservative philosophies with future conservative aspirations and which compare and contrast the liberal mindset with conservative ideals for government. The largest portion of the book consists of nineteen chapters, in each of which is discussed respective national and international issues. To a lesser degree, state government is discussed in the penultimate chapter. The author was born, reared and educated through secondary school in Lexington, Davidson County, North Carolina. He received his B.A. degree in history from Wake Forest College in 1967 and his Juris Doctor degree in law for the Wake Forest University School of Law in 1970. A practioner of law in Lexington from his admission to the North Carolina State Bar, he is married to Sandra Craver Snyder, and they have two children and five grandchildren. He is the author of sixteen books (three are fourth editions). He ran as a candidate for the United States Senate in 2002 (N.C. Rep. Prim.) and for Lieutenant Governor in 2004 (N.C. Rep. Prim. ).